First and foremost, you have to give credit to the amazing amount of work that’s been put in to satisfy the fans. In-engine cutscenes look better and more accurate to the source material than One Piece games have ever done before, with the original (Japanese only) voice actors reprising their roles and lending and an air of authenticity to every moment. The in-engine scenes (and there’s a lot of them) all look seriously good, bursting with color and accurately portraying the cast’s at times absurd facial expressions. Attacks in battle follow suit too, with moves looking and feeling like they’re straight from the anime, and certain special moves panning the camera right in so you can see fists connect with jaws. The authenticity in graphics and audio really can’t be argued with, and it looks glorious in a silky smooth 60FPS. Which brings me to the combat – most important part of any fighter, and a place where One Piece Burning Blood trumps other anime fighters, while still falling flat on its face. First off, when it comes to playing as a fighting game it feels much more like a legitimate fighting game than many other arena fighters. Wide attacks will catch anyone trying to do dodges to the side, which can be followed up with your basic attacks, unique attacks, and special moves to finish with. It’s a pretty basic combat system, but one that feels surprisingly good – once you get used to it. The problem with One Piece: Burning Blood’s combat is how laggy or unresponsive it can feel at times. For example, the end lag after one of your special moves is often much more than what you would expect, which can often make it feel like you’re standing defenseless for several seconds before you are able to act again, and when an opponent has caught you in a combo, putting up your guard can often be impossible despite what feel like very long pauses between attacks. What we’re left with then is not a combat system that is broken in any way, definitely not, but certainly one that can leave the player feeling frustrated. Being caught in a combo never feels good, but in Burning Blood you can feel entirely helpless for long periods of time. The slow combat is a bit of a shame, because when One Piece: Burning Blood is on form, it really is on form. It creates an interesting twist on traditional arena fighters by incorporating Logia and Haki abilities from the anime and manga. Logia characters are literally made up of a flowing form of some description, such as Lava, Fire, Gas, Ice – something that can be manipulated and passed through. In battle a button is dedicated to awakening these powers, where enemy attacks will literally go through your body, allowing you to counter, with your enhanced elemental abilities added to your attacks too. While this gives Burning Blood a unique twist, it also complicates things for the less-powerful members of our roster, and the game runs into an issue that’s reminiscent of JoJo’s Bizarre Adventure: All Star Battle on PS3 – when characters have wildly different methods of battle, balance falls apart. This is made obvious even by the game, when it announces that a certain Fire-wielder is naturally weak against his Lava-loving nemesis. Although it makes sense canonically, in a fighting game massive and obvious weaknesses such as this are better left ignored. The different game modes are varied, but of course boils down to the same battle system and gameplay. 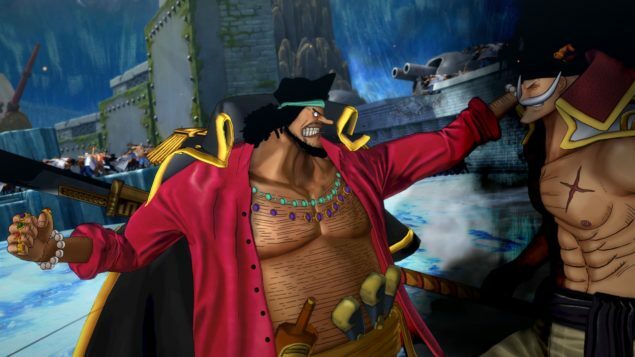 Online mode offers the obvious, while different story and Records modes allow you to pore over the One Piece history and lore. As a fighting game, well, you’ll never see it at EVO, but as a casual brawler that fans of the series can play, One Piece: Burning Blood is actually pretty great. It’s beautifully animated, sounds incredible, has dozens of unique and interesting characters to play with, and way more to sink your teeth into. Fans of the series will adore Burning Blood, but honestly, fans of the series are the only ones who should look at buying this one. Once you’ve adjusted to the at-times slow battle systems, fans are likely to really enjoy this.